The Roman army reached Exeter around AD48 during the conquest of south western Britain in the shape of the 5,000 men of the Second Augustan Legion, under the command of Titus Flavius Vespasianus (Vespasian). On a spur overlooking the River Exe, and defended on two sides by steep valleys a 37 acre Neronian legionary fortress was constructed, with the defences and buildings being almost entirely from timber and clay, and with a turf rampart enclosing an area of approximately 37 acres, the one exception being the bath-house, which had walls of volcanic stone quarried from Rougemont Hill. When excavated by the Exeter Museums Archaeological Field Unit in the mid 1970's, the Bath House was found at a depth of around 3m below the present day surface of Cathedral Close, and was covered by both Saxon and Medieval cemeteries. Following its excavation, the bath-house was covered with sand, and re-buried so that it will be possible to re-open the site at some future date and place it on permanent display. The remains are amongst the most impressive of any Roman bath-house in Britain, and the baths were large enough to be used by several hundred bathers at any one time. From this base the Legion would have been able to mount offensive campaigns into the local countryside, crushing any opposition to Roman Rule in this part of the Empire. 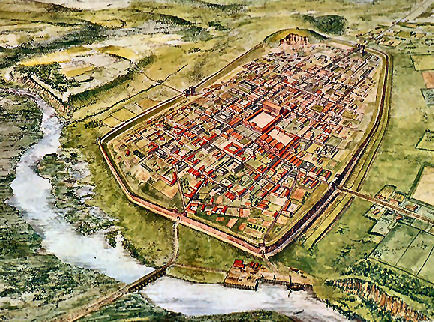 The first Roman military building to be clearly identified by archaeologists was that of the principia or regimental headquarters, which was built c.AD55-60 and could have housed up to 5,000 legionaries and perhaps also a cavalry regiment 500 strong., and was found below the administrative buildings of the later Flavian period. This H.Q. building lay at the centre of a 37 acre (15Ha) enclosure which is rather small for a legionary fortress, which were usually around 50 acres (20ha) in area, and it seem likely that the camp was never intended to house the full complement of the Second Augustan Legion. This reduction in the legionary complement could be for two main reasons; either the legion had suffered losses of over a thousand men during the earlier campaigns throughout southern England, or a number of cohorts were housed elsewhere, perhaps at Corinium in Gloucestershire or even on the Continent. The fact that the fortress was built on a reduced scale must prove that the Roman military did not expect these missing men to suddenly return. They established a string of smaller forts stretching to the north, and to date these have been identified at Bury Barton (Lapford), above Bolham outside Tiverton and near Clayhanger, as have several smaller forts on the North Devon Coast. More recently extensive iron workings have been discovered near Brayford, which more than likely originated under Roman control. So, on many occasions the Devon countryside would have echoed to the clinking of Roman armour and cavalry harness. Communications between the various Roman units were of paramount importance, and the prehistory tracks throughout the county would have been adapted and new roads built to link the military sites. It seems that only the most commonly travelled routes were laid with stones. One Victorian antiquarian suggested that one such road ran from Exeter, by way of Crediton, through Woolfardisworthy and Witheridge, by Knowstone to Molland, "but it has not been distinctly traced in this part of its course." The same source similarly records that in 1844, a silver coin of the Roman Emperor Antoninus Pius (138-161 AD) was dug up in Witheridge, but we have no other record of this discovery. More intriguing and, potentially more exiting, is the earthwork known as Berry Castle, which lies in a field besides the road from Bradford Mill to Queen Dart Cross. It is possible that this site is all that remains of a Roman watch tower or look out post. It is typically Roman in that it is almost square in shape, measures 95ft by 98ft, is surrounded by a wide ditch and the interior is defended by a rampart. Although the height from the bottom of the ditch to the top of the interior rampart is now just over 3ft, in the 1860's it was said to be about 13ft high. There is now a clear entrance to the interior across the ditch on the east, but this was apparently not in evidence as late as the 1890's. At this time it was suggested that "the entrance must have been on the south side, and cut away in making the road to Bradford Barton, as there are no indications of an entrance through the remaining entrenchments." It has also been suggested that Berry Castle is a moated site of a later period, but hilltop locations for such structures are rare; there is no way of feeding water into the moat apart from natural rainfall. Throughout Roman Britain local people continued to live and farm with little disruption from the occupation. An added bonus for some was that in the vicinity of military sites there would have been opportunities to supply provisions to the troops. Perhaps this was the case for the local Witheridge farmers if the site near Queen Dart was indeed a watch tower. Aerial photography might have discovered some of the sites of the local farms. There are possible sites at Lewdon near Thelbridge, and nearer still at Dart Raffe Farm. The most likely though is the example revealed near Drayford, where marks in the crop's show three joined rectangular enclosures, the middle of which is double ditched with a south facing entrance. Antoninus Pius ruled over Rome at its pinnacle of peace and prosperity. Having been offered the position by Hadrian when his appointed heir, Aelius Ceasar died. As a condition of this offer, Pius was to adopt both the young Marcus Aurelius and the even younger son of Aelius, Lucius Verus. By this action Hadrian ensured that he could pass the Empire on as he had intended even though the boys were too young to rule. Antoninus was to be a caretaker. Not only did he accept these conditions, but on the death of Hadrian, he kept to his promise. Unless otherwise indicated on the page in question, the photographic images reproduced on this site belong to the Witheridge Archives, and, as such may not be reproduced for commercial purposes without written permission. However, you are welcome to use any of the photographs belonging to the archive for personal and/or non-commercial use. Any material shown as not being owned by the archive may not be reproduced in any form without first receiving written permission from the owner of the material in question. The image of the Roman Fort is reproduced courtesy of Devon County Council.